In the late 80's and early 90's, the internet was not yet widely available to the American public. 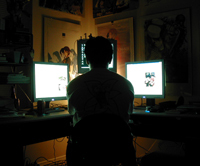 Anime fans were already online, however, communicating with each other and sharing resources on services such as Prodigy, CompuServe, AOL, and GEnie. On a more local level, anime content could also be found on some BBSes, and there were even some anime-specific BBSes. Those who had access to the internet also shared material via Usenet, FTP, and Gopher. A lot of these became much less important after the World Wide Web took off in the mid-90's, but looking back, we can appreciate how they paved the way for today's vast information culture surrounding anime. 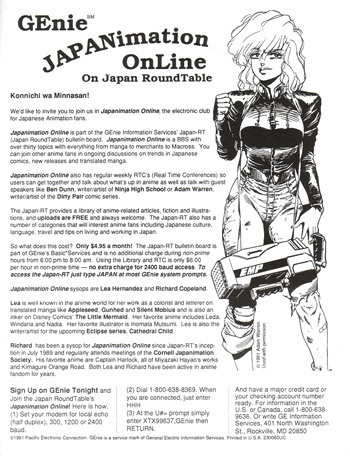 Here is a print ad from 1991 for the anime discussion boards found on GEnie. Students of CJAS history should take note that one of the two sysops for the anime board was Richard Copeland, who (according to the ad) regularly attended CJAS (then known as CJS, the Cornell Japanimation Society). Lea Hernandez, the other sysop, was the vice president of General Products USA (the American merchandising division of Gainax) from 1989-1990. One way that old school anime fans shared information with each other was through text files that were distributed across various bulletin boards. Anime Stuff, first published by Tom Mitchell in January of 1987, was one of the most well-known newsletters. Tom was a sysop of "The CompuServe Anime & Manga Forum". Starting with issue #5 (11/12/1987), none other than CJAS co-founder and first president Masaki Takai joined Tom in producing the newsletter. Masaki, then a freshman at Cornell, hadn't even started CJAS yet (the club was "born" on September 9th, 1988). An even more accessible collection of Anime Stuff can be found here: Index of /OSA/PUBLICATIONS/anime-stuff courtesy of J!-ENT's Old School Anime website, which is a pretty fun read if you were a fan from that time, or if you're interested in that particular era of fandom. Some readers might be interested in the interviews with Roe Adams and Masaki, in issues 17 and 20 respectively, where they talk about the early days of CJAS and the founding of Animeigo. Very cool! I got into anime around 1995-96ish online, so this is very relevant and interesting to me. I actually came in search of info about General Products, and this article has more info than I've seen elsewhere on them. I wanted to read your blog, I enjoyed reading your blog. there is a lot of good information on your blog, I loved reading it and I think people will get a lot of help from this (AOL Tech Support Number) blog. Sam, I have written this kind of blog, You can also read this blog. I think you will get a lot of help from this too. I hope you like my blog, I hope you got a lot of help from this blog.